All of the information for our campground and the other sights we saw will be in part two of this blog, when and if we ever leave Osceola, MO! In the meantime enjoy a little bit more of Route 66. 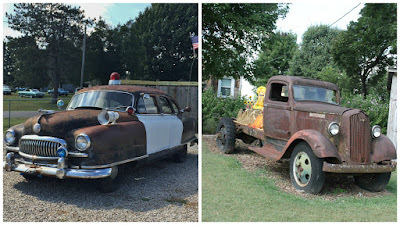 One days adventure was picking up Route 66 in Springfield, MO where we left off from the last stop. We took it all the way to the border in Joplin, MO. The old highway goes right through downtown Springfield. 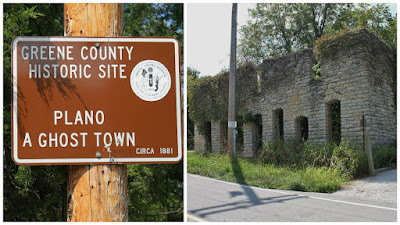 We discovered that this is the "birthplace" of the Route 66. It all happened in the Woodruff Building. Which is now called the Sky Eleven. 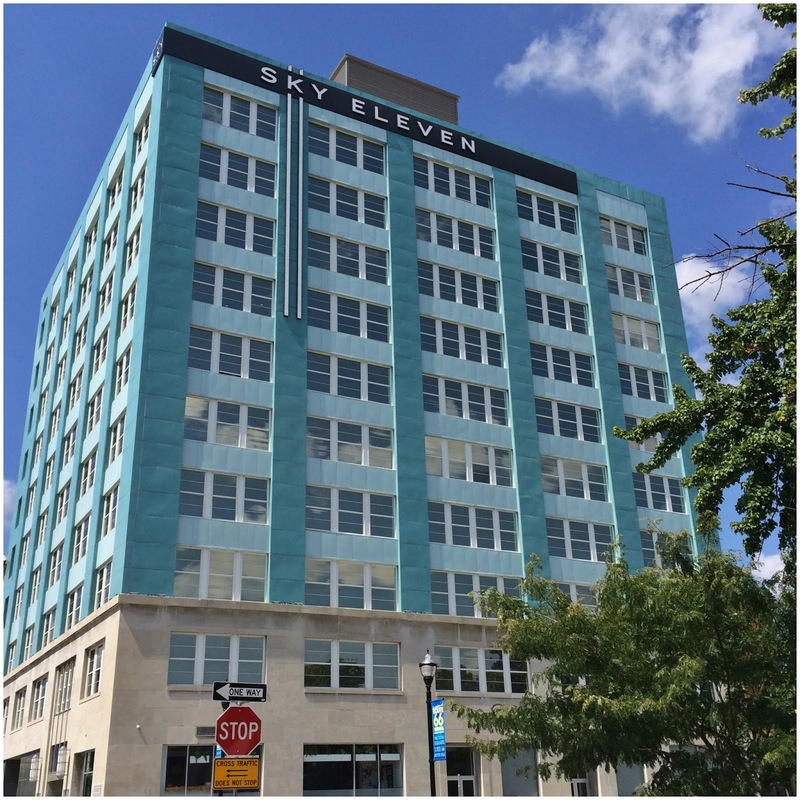 It was built in 1911 by John Woodruff and the 10 stories were a big deal at that time. In 1925 Congress enacted a law for national highway construction. Woodruff teamed up with the chairman of the Oklahoma Department of Highway and together they mapped out the diagonal course of Route 66. 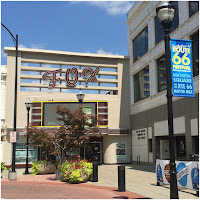 On April 30, 1926, Woodruff sent a telegram proposing that the road from Chicago to Los Angles be named Route 66, and so it was, and that is how Springfield became the birthplace of the route. Before we made it to the Sky Eleven building we stopped at the Jefferson Avenue Footbridge. It was built in 1902 so people could safely cross the railroad tracks, and they could watch the trains. It is believed to be the first bridge of its kind to be built in the area. It is 562-feet long and the 3-steel cantilever trusses cross thirteen train tracks. It is currently being restored so we couldn't walk on it. Pretty sure our son-in-law, Steve would love it. 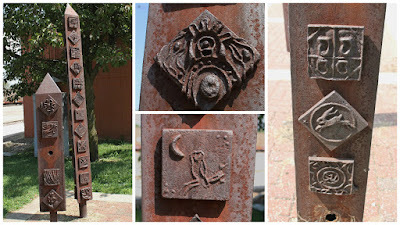 In the park at the stairway to the bridge are two metal peace poles, each has a number of sculpted panels on them. Nancy found some new inspiration for her doodles. In 1962 Steak 'n Shake opened its doors on E. Saint Louis Street. It is one of just a few of the original Steak 'n Shake buildings left in the country. 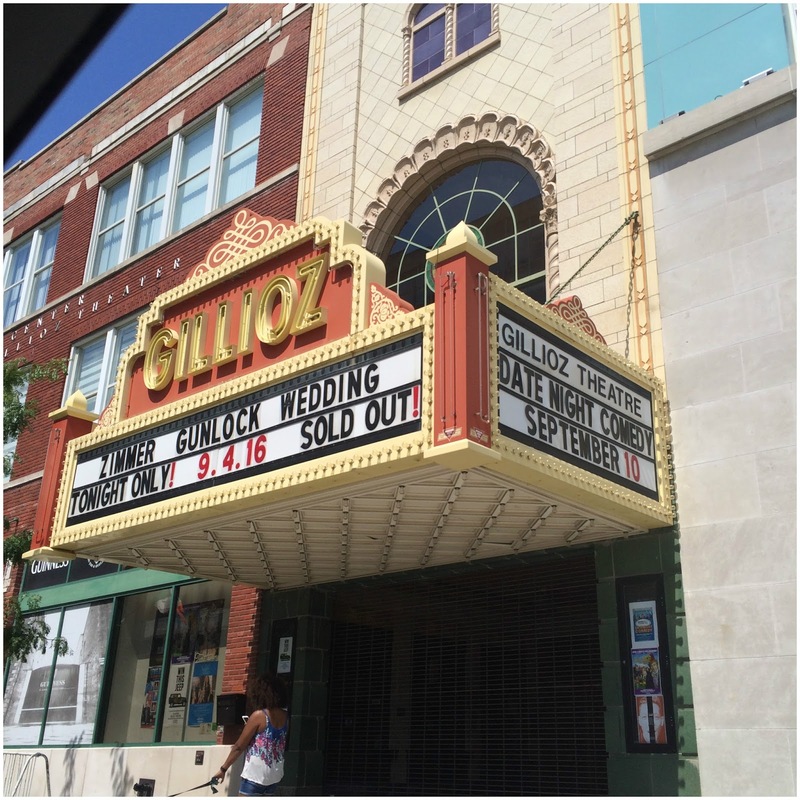 The Gillioz Theatre is right next to the Sky Eleven building. It was built in 1926 and has a lavish Spanish decor. It was a popular stopping point for travelers. It sat vacant for a number of years until is was refurbished and reopened in 2006, it hosts concerts, comedy shows and can be rented out for private events, like weddings. 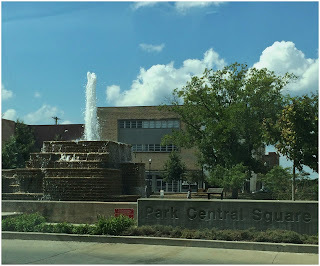 There is a pretty square in the center of town, with a large fountain, plants, trees and benches. 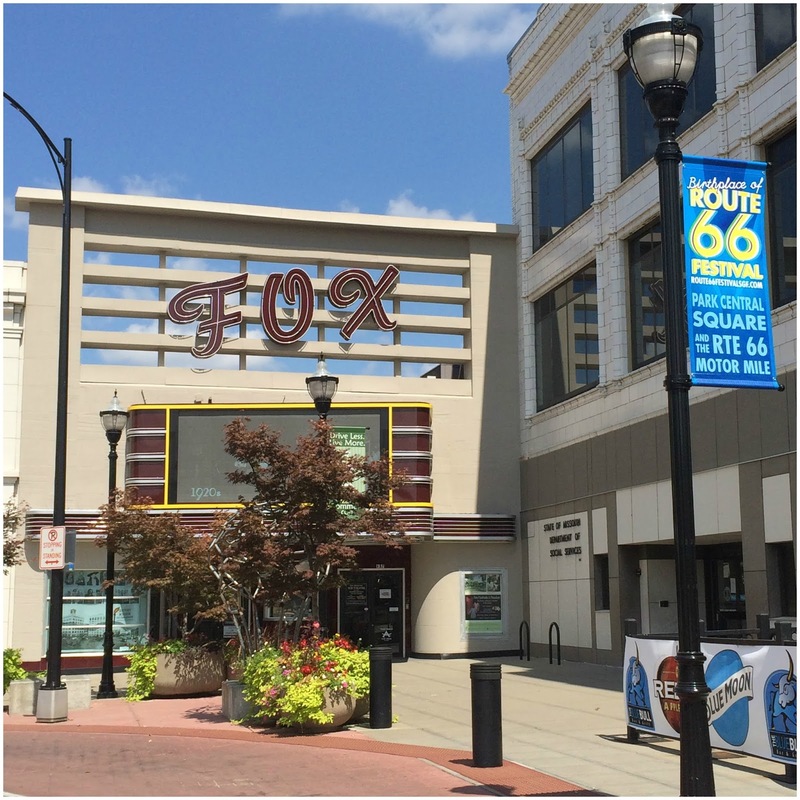 Surrounding the Park Center Square are shops and restaurants and the Fox Theater. We wondered if it is as nice as the one in Detroit, plus it's our daughters last name. 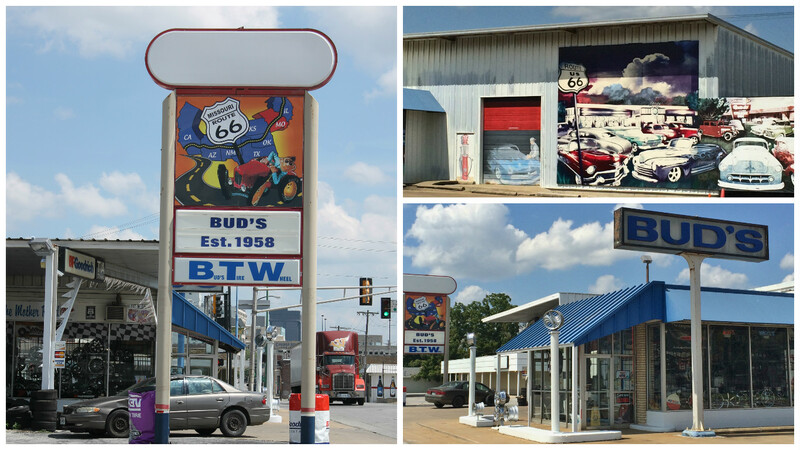 Bud's Tire and Wheel opened in 1958, it was the first custom wheel shop in the area and possibly the U.S. They still offer custom wheels along with other custom car work. Next to Bud's is a replica of the car used by Bonnie and Clyde. They traveled through this area. The mural that is painted on the car windows make it look like the couple are running from the law. 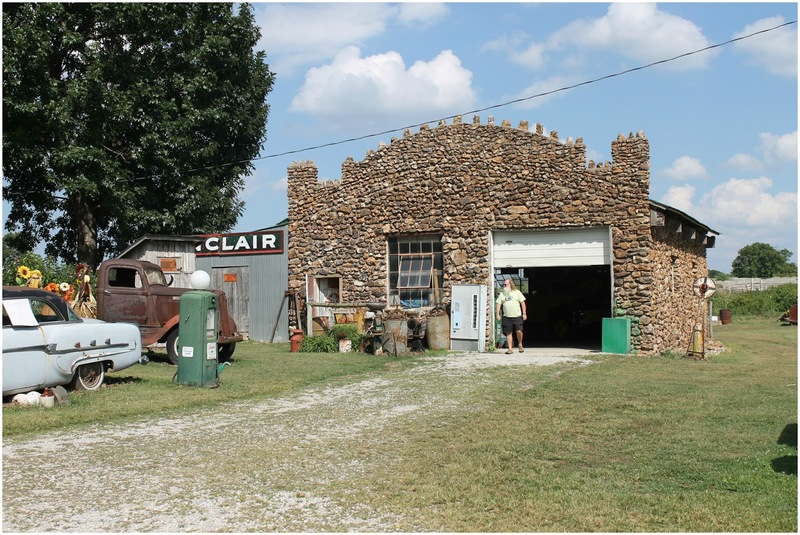 Rock Fountain Court was opened in the early '40's and the nine freestanding cabins have the signature Ozark sandstone finish. Today the cabins are rented out as homes. We have a found a number of these older cabin motels have been converted into permanent residences. 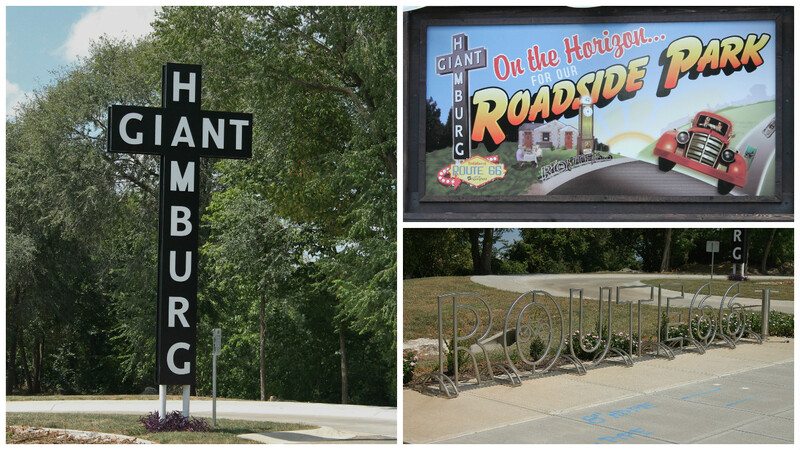 The Birthplace of Route 66 Roadside Park, is a work in progress. 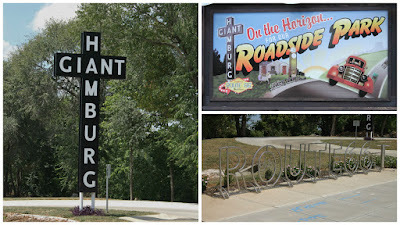 The property was home to Red's Giant Hamburg, possibly the first drive-through restaurant in America. Red thought is would be more convenient for customers to be able to just order through the kitchen window than to wait on car-hops. Red made a giant sign but didn't measure correctly and had to cut off the "er" at the bottom of the sign to avoid electrical lines. The restaurant closed in 1984 and years later the idea of the park was born, the sign is the only relic at this time. Heading west out of Springfield on Route 66 we came to Plano, MO first. There is nothing left but the ruins of a store that was built in 1902, it was a general store and also the town hall, church and hotel. Plano has officially been named a ghost town. Our next stop was the best one of the day. 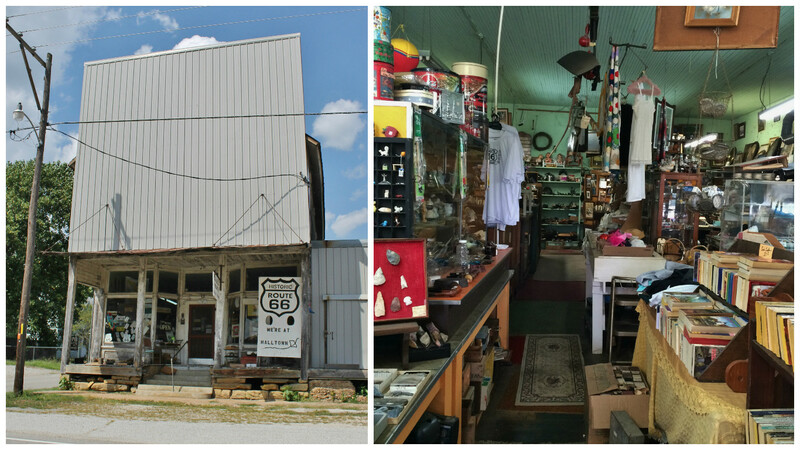 Halltown is home to Whitehall Mercantile. 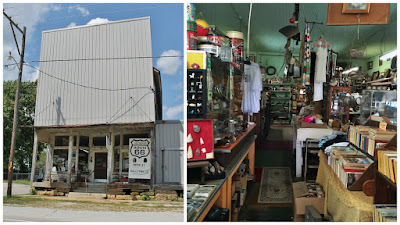 It is an old building filled to the rafters with antiques of every sort. We had to walk the aisles a number of times and we still couldn't take it all in. 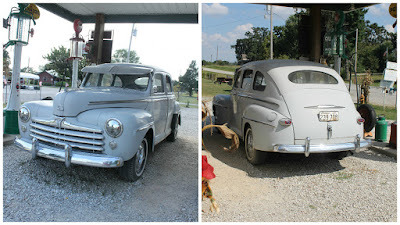 The best part was our conversation with Dr. Jerry White, the owner. He is 87-years old and he entertained us with great stories of the area and his life. He even played the harmonica for us. The store was his wife's project until she passed away and now he runs it. He was a preacher and then a school administrator. He has the best chuckle we have ever heard, a mix of humor and a little bit devious. Once he found out Nancy loves old rusty things and metal pieces he was like a kid in a candy store showing her all his treasures. Unfortunately, the store will be closing at the end of the year, as the building will be sold. Jerry has no idea how he will get rid of everything, but figures the Lord has it all worked out for him. 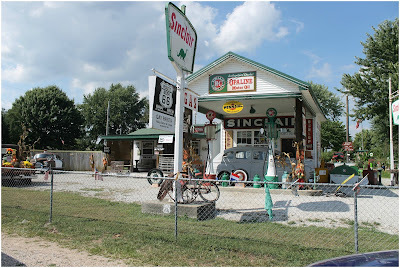 In Paris Springs we had another great conversation with George at the Gary's Gay Parita Sinclair Gas Station. 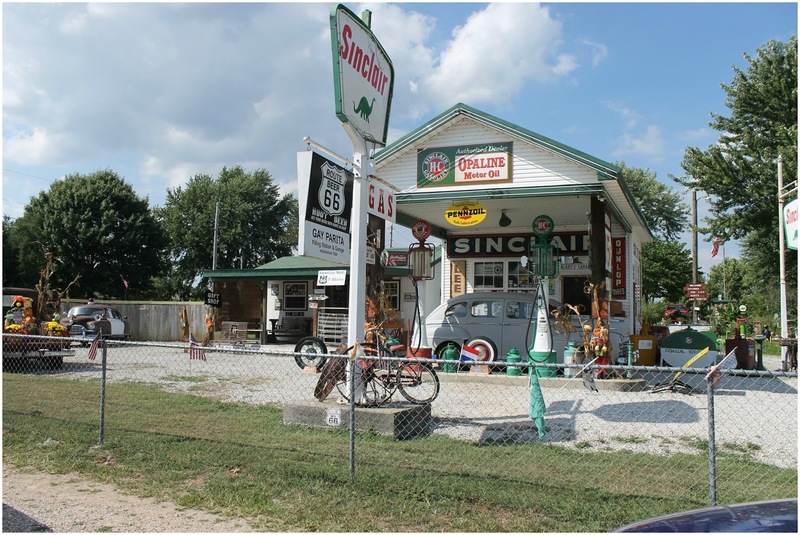 This is a recreation of a gas station owned by Fred and Gay Mason in the 1930's. The cobblestone garage, built in 1926 is an original building, the rest of the buildings burned down in 1955. Gary Turner wanted to bring it back to life and built this homage to Route 66 and roadside travel. Gary passed away in 2015 but his daughter Barbara and her husband George keep the memories alive. 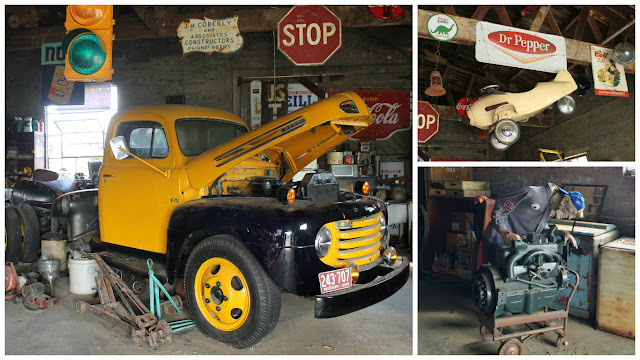 Inside the garage is a refurbished truck and a mechanic that may have worked just a little to long. The grounds are lined with old cars and trucks. When Route 66 came through downtown Carthage it was a booming town. 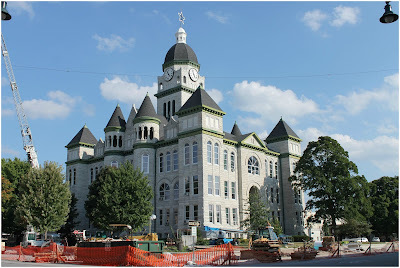 Their courthouse is an example of the good fortunes this town once had. The town is still very active, but not like it once was. They do have one of the few remaining Route 66 drive-ins that is still in operation. The Boots Motel is a prime example of motels that once lined the route. Each unit has a small car port, some motels had actual garages. It appears that these are now extended rentals as each carport was decorated differently. Webb City is another town that has lots of historic buildings, and a fairly thriving downtown. There is not really much about Route 66 except for a mural on the side of Bruner Pharmancy. 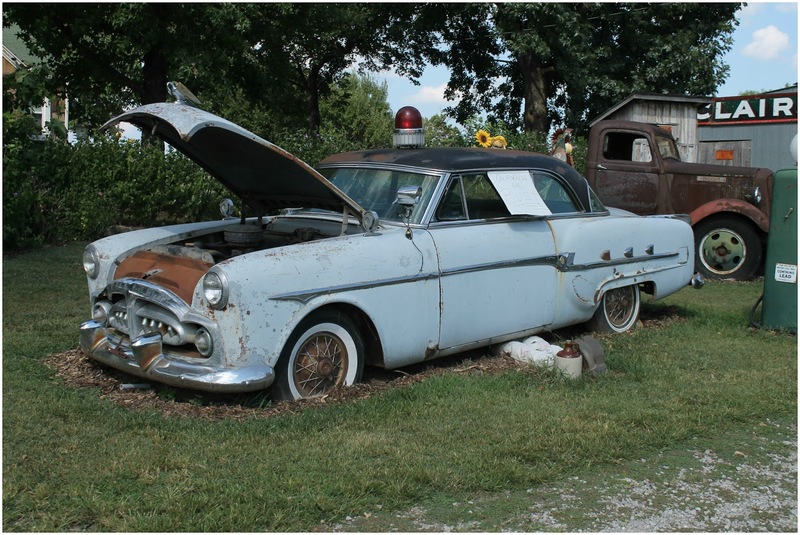 As you head out of Webb City on your way to Joplin, Route 66 takes a number of turns. 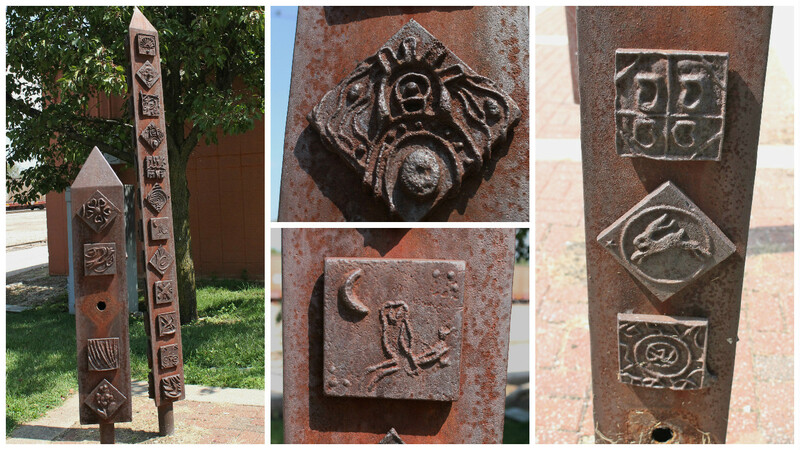 Eight to be exact, which leads you to main street in downtown Joplin. Joplin has a rich history of being on the opposite side of the law. Many gangsters found their way here back in the day, and Bonnie and Clyde were no exception. They rented an apartment here to lay low for awhile. When authorities caught up with them, they fled in such a hurry that they left a camera behind. After developing the pictures the police finally had photos of the couple, the first time anyone knew what they really looked like. The apartment is private property but there is a historical sign in front of it. The main house and the apartment are for sale if you have a desire to move to Joplin, MO. 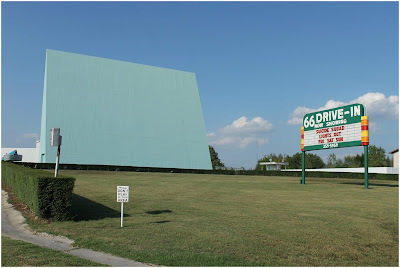 More Route 66 to come on our upcoming stops and more information about the area in Part Two of Osceola coming soon. Our tip will be included in part two. So for now we suggest you go out and make it a great day.